Please join me for an Author Discussion with your Book Club or a group of friends. Just go to the Book Club or Contact tabs above and schedule a session in person or by Skype. It's been a pleasure to chat with a wide group of folks interested in learning about addiction or just wanting to tell me what they think about Shawn Marks, that egotistical but likable big shot attorney from Boston. Although some of you think that Jimmy, the heroin addict from away, was falsely accused; was he? And don't forget what Aunt Betty said, "When people are high on drugs, accidents happen and sometimes it looks like it wasn't an accident.” I hope my book will continue to entertain, keeping readers on the edge of their seats while also exposing the life of addiction. Oh yes, one more thing - Is Shawn Marks able to fall in love? 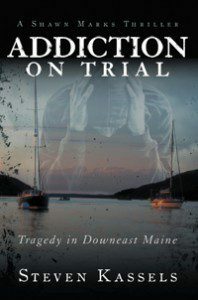 “Addiction on Trial: Tragedy in Downeast Maine” by Dr. Steven Kassels is a unique medical murder mystery/legal thriller that entertains audiences and educates readers through the realistic depiction of the struggles of addiction. The book dissects our societal discrimination toward drug addicts and explores common misperceptions of what addiction really is – a chronic illness requiring a similar treatment approach as other chronic diseases. The book exposes the real challenges of addicts and their families through a trio of characters who are drug dependent on heroin and cocaine as well as a father who is consumed by alcoholism. The medical topics unfold while the reader is exposed to a riveting murder trial and the adventures of Shawn Marks, the egotistical but likable Boston big shot attorney, who juggles an array of female companions without taking his eye off the legal challenges in Downeast Maine. 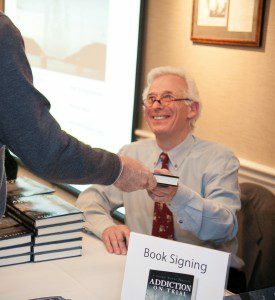 “Addiction on Trial” combines Dr. Kassels’s professional experiences with current events by delivering its messages in a non-scientific, approachable way in hopes of changing hearts and minds of how best to approach the scourge of addiction. Kassels hopes the book will help to clearly define the disease of addiction as an equal opportunity illness that has no socio-economic barriers while providing insight into the current heroin and prescription drug epidemic ravaging our communities. Dr. Steven Kassels is an author and physician who has been board certified in Addiction Medicine and Emergency Medicine. A graduate of Milton Academy and Lake Forest College, he received his medical degree from Wayne State University School of Medicine in Detroit, Michigan. He has served as chief of Emergency Medicine at an inner city hospital and currently serves as the medical director and founder of Community Substance Abuse Centers. Dr. Kassels is a member of the American Society of Addiction Medicine and has presented numerous lectures and round table discussions on drug abuse related topics. Dr. Kassels currently resides in Boston, Massachusetts and Southwest Harbor, Maine. Posted in Author Blog. Tags: Addiction On Trial, Book Club, Dr. Steven Kassels on April 26, 2014 by skassels.